Bournemouth are now unbeaten in their seven Premier League meetings with Leicester. Nobody got this spot-on, but 12 did have the outcome. All 10 of Arsenal's Premier League goals this season have been scored by different players - including one own goal. Newcastle's goal in the 91st minute was good news for the 9 who had this spot-on, in what was equally the weeks most predicted result, and a further 16 got the outcome. An 89th minute equaliser extended Leeds unbeaten league start. Just the 2 got this spot-on, and nobody had the outcome. There were 24 who predicted a win for Leeds. Wednesday came from 2-0 down to rescue a point. Well done to Colukev for being the only one to have this spot-on, but 6 did get the outcome. There were 21 who predicted a win for Wednesday, with 9 going for a 1-0, in what was the weeks other most predicted result. Portsmouth remain unbeaten in the league as they inflict a first defeat for Peterborough, and move above them to the top of League One. Only 2 got this spot-on, with the 3 having the outcome all going for a 3-1. There were 16 who predicted a win for Peterborough. Exeter bring an end to Mansfield's unbeaten start to the season. A decent 5 had this spot-on, and 4 more got the outcome. There were 16 who predicted a win for Mansfield. I thought this weeks fixtures were the most intriguing 6 game ones I had picked this season, and the results proved it wasn't easy. Although five games produced a well predicted team, only Arsenal delivered, and it was them who saved a number of members from having a blank week. So overall another tough week that produced a reasonable total of 19 spot-ons, but only 41 outcomes. Just two members managed to have two 3 pointers, the best being ghughes11, who had the Arsenal 2-1 and the Millwall 1-1, and with one outcome, he is the weeks top scorer with a decent 7 points. Also with two spot-on was unitedwhites, the 2-1 wins for Arsenal and Exeter, to give him a very good 6 points. A points total also obtained by sevebalo and basher2010 who came out best of those who got one 3 pointer. In the Premier By having the Arsenal 2-1 spot-on RSCOSWORTH added to his impressive 3 pointer haul for the season - will the record for them be broken for the second season running? - and increased his lead by a point. Two outcomes were enough for gsy163 to remain second, and noah4x4 regains the final Charity Shield spot thanks to having the Exeter 2-1 spot-on. Solid weeks from gerry_us and sevebalo moves them both up three places, and into their highest positions so far this season. A 3 pointer for the second week-in-a-row was not enough to stop thrillseeker dropping back into the relegation zone. In Division One That good Sheff. Wed. 2-2 pick kept Colukev on course as well to beat the thrillseeker 3 pointer record, but with oxfcolu getting 3 outcomes, it is as you were in the automatic spots. 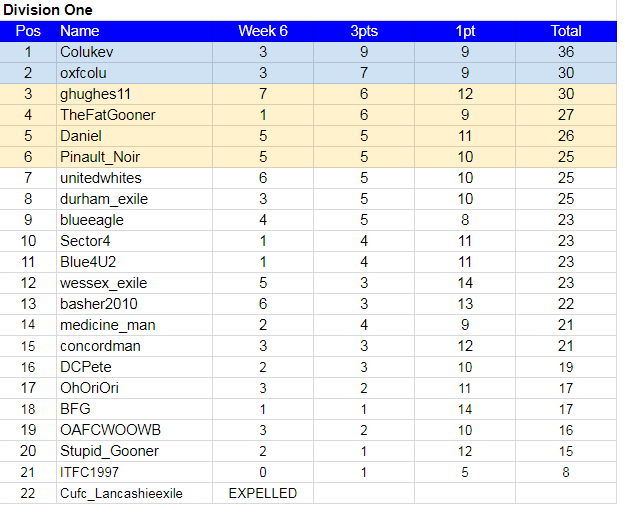 The top scoring effort from ghughes11 moves him up another place, and he is joined in the play-off spots by Daniel, whose consistency in scoring 4 or 5 every week so far, has got its reward. By posting first Pinualt_Noir moved up three places into the final pay-off spot. The weeks biggest mover was unitedwhites, up five places, and just missing out on the play-off spots by the first to post rule. But with only 6 points separating 4th down to 15th, this league remains very condensed in this early stage of the season. *These fixtures are from the National League. Nice to see a decent team at end.